Safeway delivery isn’t just one delivery service. Getting groceries from Safeway is not only really easy, it’s a dream filled with nutritious breakfasts, hefty lunch breaks, and huge family dinners. But there are a few things people need to know about Safeway before they go ahead and order their groceries from the company. To this extent, we present to you our guide to Safeway delivery. Here’s all you need to know about Safeway: from the way they handle their customers, to how they deliver, how you can order from them, and even what type of food they have to offer. Safeway grocery delivery brings commodity to your door and groceries to your table. And it’s easy! First off, let’s see the three options you can choose from if you want to order from Safeway. Order through shop.safeway.com. This means you will be picking your groceries directly from the official Safeway Home Delivery website. This option is best if you want to interact directly with the company. Order through the Safeway Android app. To do this, all you need is the app that can be found in the Google Play Store. Simply go to your Android device and search for Safeway. After the app is installed, the process is pretty much the same as in the online store. Order through Instacart. Just like most grocery stores across the nation, Safeway has also partnered with Instacart to bring fresh food to your door. The best thing about this is that you will be making use of Instacart’s acclaimed delivery service. No matter which of these you may choose, the results are all in all the same. Next up we’ll be reviewing the exact process of ordering via the Safeway.com delivery website and the Safeway delivery Android app. Go to safeway.com or open the Android app. Simply access the website where you will be greeted by a message stating the advantages of ordering from Safeway. Pick how to shop. Next you get to pick your way of shopping, just like in a real store: by history, or by aisle. The Android app has the added bonus of allowing you to scan barcodes of previously purchased items. Pick your items. Sift through the generous amount of things you can buy from Safeway. Browse the aisles, your history, or items that you have around your house and scan their barcodes. Add all of these to your shopping bag. Select a delivery window. There are three delivery windows you can choose from (ordered by Safeway delivery fee from high to low): 1-hour window, 2-hour window, Green 4-hour window. More about the fees in the respective section below. Select your preferred payment method and then checkout. Your delivery should arrive within the specified timeframe. Safeway delivers to most regions in the US. With over 1,335 locations throughout the United States, it’s easy to see why the chain has such a widespread delivery system. 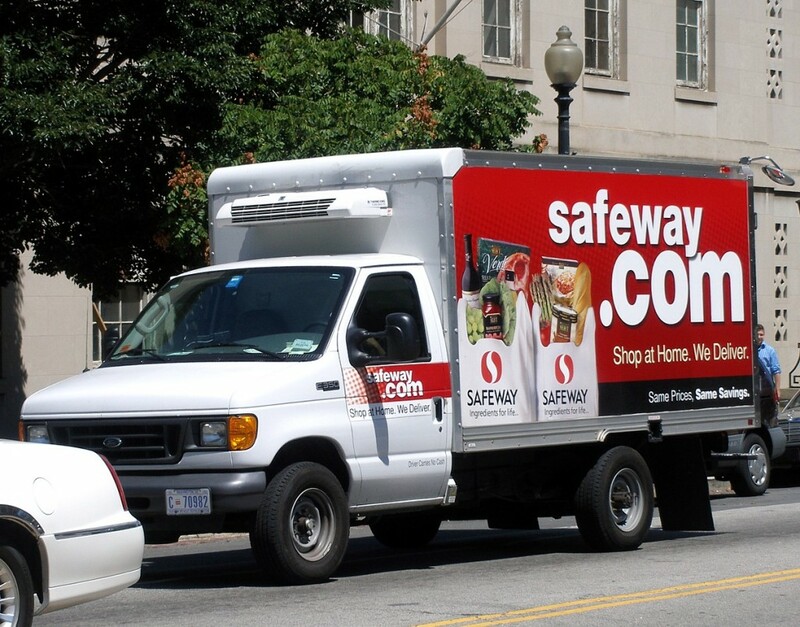 Basically: if there’s a Safeway near you, then Safeway Delivery is just a click away. Most importantly, it should be noted here that Safeway home delivery fees largely depend on where the order is placed from. This is because of fuel price variations and drive distance. There are three delivery windows that are available for Safeway grocery delivery. The Safeway delivery cost depends greatly on the delivery window you choose. 1 Hour Delivery. The one-hour delivery is the most expensive off all time-frames but has the added convenience of being available for those with tight schedules. 2 Hour Delivery. The two-hour delivery is the most reasonable. The delivery fee is decent and the time-frame is just about right. Plus you can get your items within 1 hour if the driver’s schedule isn’t that loaded. 4 Hour Delivery. Also known as Green delivery, this delivery is the most environmentally-friendly and will also charge you less money. Pretty cool, eh? Saving the world from climate change and getting groceries, one Safeway food delivery at a time. Important: for select areas in the US, Safeway also provides unattended delivery services. This means that they will leave your groceries by the door. This type of delivery is not possible for alcoholic beverages. Also, you must make sure that the driver can access your doorstep and that the neighborhood is safe. There are a lot of fees applicable for Safeway deliveries. These fees can be avoided if you use Safeway delivery promo codes or other discount codes. Another way to avoid the extra fees is by very carefully choosing the delivery timeframe. Additionally, all first-time users of the Safeway delivery service will get a Safeway free delivery by entering the promo code EASY7 at checkout. This promo code is subject to change according to Safeway and is only usable for the first purchase that a user makes. Delivery fee. This simple delivery fee has two values and which apply to purchases of less than $150 and of over $150. The first fee is of $12.95, and the second is of $9.95. All orders between $49 (minimum purchase value) and $150 will be taxed with $12.95. Fuel surcharge fee. This fee applies in areas where the fuel price is over $2.75 per gallon. All excess prices will be added to the cost of your delivery. Bottle deposit fees. Because glass bottles are extra fragile, delivering them will cost extra. Bag fees. Bag fees are added for deliveries where you do not provide the bags. Hey Buddy!, I found this information for you: "Things to Know about Safeway Delivery". Here is the website link: https://all2door.com/things-know-safeway-delivery/. Thank you.